I am so buzzed up and high right now from meds it's not funny so this will just be a short post. I seriously can barely sit still at the moment! 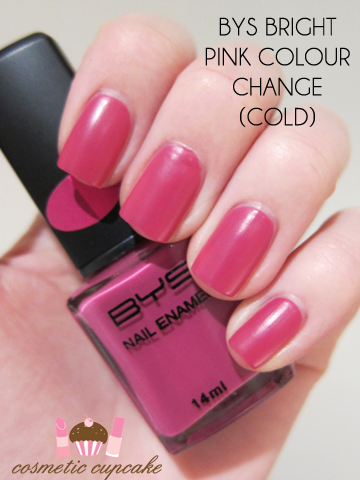 The weather here in Sydney has been miserable so I decided to try out one of the new BYS Colour Change polishes to brighten my mood. 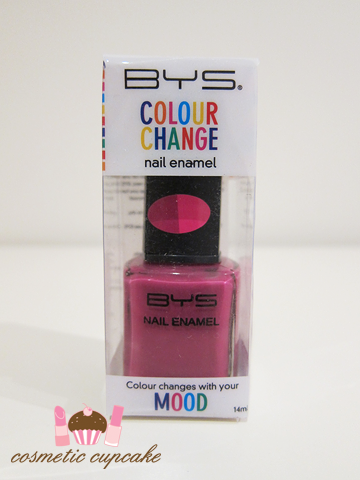 I was soooo excited to hear that BYS were bringing out mood polishes and in some fantastic colours too. As I'm going to Hong Kong next week (again yes!) I only picked up 2 but there are 7 colours in the collection. One of the ones I bought was Bright Pink which I have for you today. 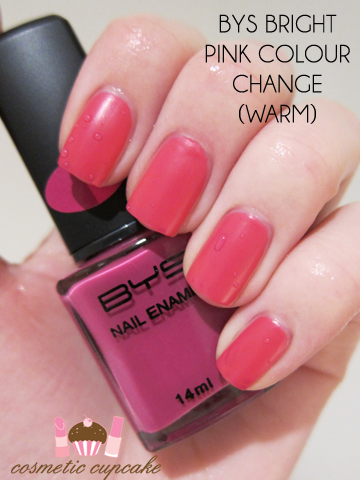 Bright Pink is exactly as the name describes - a bright pink and it is gorgeous! I prefer it when warm as it becomes this beautiful almost neon pink. When cold, it's a darker pink that's every bit as lovely but a little muted. It applied nicely and 2 coats were needed for opacity and it dried to a satin finish. I have particularly cold hands so I had to run my hands under warm water to make the colour change last so I could take photos =p Ignore the drops of water! I couldn't resist adding topcoat (I used Poshe today if you're wondering) and WOW!! It just takes it to a whole new level, just stunning. I could not stop staring at my nails all day - I kept admiring the cool colour change haha. I also added a floral nail sticker for some quick nail art! It was very difficult to capture the colour change on camera (it's more noticeable in real life) but in the pics below you can sort of see the tips are darker. I'm off to paint my nails/eat/bounce off the walls. Thanks for looking ladies!! Don't forget to enter my Glitter Gal giveaway! Anyhoos, that's such a pretty pink & so cool that it changes. Must get myself to a BYS stockist ASAP. Eee I have always wanted mood polishes! I am going to Hong Kong in a couple weeks myself and am hoping to pick up some goodies they don't have in Canada! Such a lovely art work on nail paint. I like this blog. So sweet color it look like. I really really love these! !